Jabu (second left) leads others to enjoy the food. From right are Sikie and Dennis. Jabu given a warm welcome. 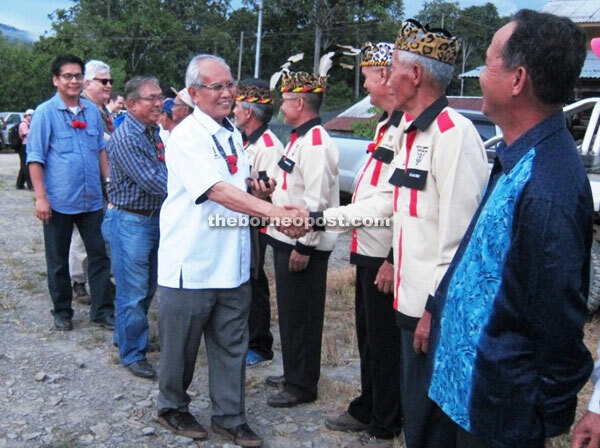 MARUDI: During their recent visit to the Long Peluan region, Deputy Chief Minister Datuk Patinggi Tan Sri Alfred Jabu Numpang and his entourage were brought to a picnic spot called ‘Peluan Karangan’. Popular among the Kelabit and Saban communities in the area, the area is full of stones that are good for foot reflexology. There, Jabu and his entourage were served with traditional Kelabit food such as nasi, bungkus, (rice packed in leaves), fish and meat cooked in bamboo, local fern (paku) and vegetables (ensabi). Judging by their mood, it was clear that they enjoyed themselves. Following that, the entourage went to Peluan Nursery to inspect the high yielding rubber seedlings there. At the nursery, Jabu who is Modernisation of Agriculture Minister, explained to the foreign visitors from England and Scotland in his entourage how the high yielding rubber trees are cultivated. Others in Jabu’s entourage were Assistant Minister in the Chief Minister’s Office (Native Adat and Penan Affairs) Datuk John Sikie Tayai, Baram member of parliament Anyi Ngau, Telang Usan assemblyman Dennis Ngau, Deputy State Secretary Datu Ose Murang, Ministry of Modernisation of Agriculture permanent secretary Datu Dr Ngenang Janggu, Datuk Temenggong Hassan Sui and Miri Resident Anthonio Kathi Galis.